If you are attempting to recover content off of a deleted domain or an old website, the Wayback Machine can be a lifesaving resource. And other times it can be extremely frustrating. Error: Page cannot be displayed due to robots.txt. Sometimes a website displays just fine one day, then you go back to the Internet Archive’s “Wayback Machine” to get the content and it is gone. This is a very common scenario since digging through the archive is a very slow, time consuming process. Weeks ago I bookmarked the site I’m interested in, and somehow I cannot display it anymore. Why can’t I see my site on the web archive? The Wayback Machine has a problem and is broken, when will they fix it? Even if the content has been on the Internet Archive for 15 years, if a site, for any reason, suddenly has a robots.txt which blocks crawlers, all of the archived content on the Wayback Machine suddenly becomes inaccessible. This is very irritating because Wayback Machine has neglected to assist people with this for over a decade now and has, as far as I know, no policy or explanation on their website. Threads in their forum go back to 2006 with people trying to figure out what the flaw is. Apparently, this is by design. It adds salt to many people’s wounds who already lost their content once, were overjoyed to have found it, and then lost it a second time – this time – permanently. To further frustrate people: I do believe the content is sitting on the Internet Archive’s servers. If you’re reading this, you have likely lost access to the website. IF you do have access to the website, fix your robots.txt file to allow spiders to crawl it, and ta-da, Wayback Machine will once again display your old content. If you do not have access to the site’s robots.txt or the site has been 301 redirected, you’re out of luck. 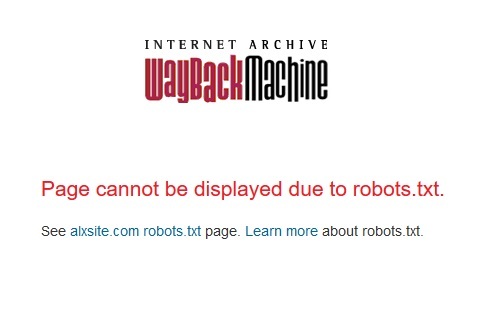 Did Wayback Machine block you from old content you were trying to reach? and I still cannot get into the archives. Ugh. So I should have mentioned this above, but once changing the robots.txt file, you will have to wait until the Wayback spiders hit it again and discover crawling is allowed. I just experimented with this a couple of weeks ago, and I had to wait a good 4-5 weeks. I am not certain how often their spiders try to crawl certain sites but I suspect it varies drastically from site to site. If you page was crawled and you just updated the robots.txt file, the content will come back eventually! Good article explained every problem i was facing with web archive, keep up the good work. cheers!